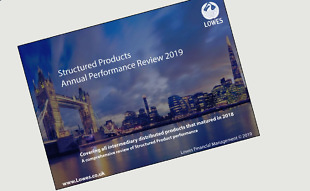 While investors may have had a bumpy ride in 2018, it proved to be a tremendous year for structured products, according to Lowes Financial Management’s latest Annual Performance Review. Not a single retail structured product matured last year with a loss, a startling statistic that justifies their place in the wider investment landscape. Lowes’ newly-published annual review provides a rich and comprehensive overview of 381 investments. While the number of maturing securities in 2018 was half the number of the previous year, Lowes’ data reveals this area of the market has become ‘cleaner’ with the majority of retail plans exposed to mainstream indices.